Bentonite clay is used in mud rotary drilling. It's unique properties make it an important component of the drilling process. Bentonite forms the "mud" used by the drillers to lubricate the bit, remove cuttings from the borehole, and keep the sides of the borehole from caving in. 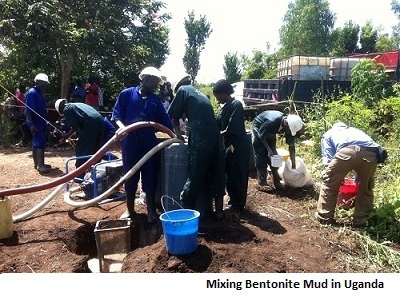 As we found in Uganda, proper mixing of the bentonite gives the resulting slurry the properties needed to drill a successful borehole well using a mud rotary drill rig. Sandy soils in the area created boreholes with sides that caved in easily. The bentonite clay mud had to be mixed properly to prevent this from happening. You will learn more about this in these pages. Water well drilling by any method requires training, skills, and especially experience, to be successfully and safely accomplished. Mud rotary drilling, likewise, is a skill that must be learned. It is important that anyone on a drilling team receive proper training in well drilling. Safety and success depend upon proper training and preparation. It would be unwise for anyone to take the information found in these web pages and think that they could jump on a drill rig and successfully and safely drill and construct a water well. You could easily be injured and you could easily fail at your attempt to complete a well. As noted on the page entitled "Great Organizations" , there are places you can contact that offer training in the art and science of water well drilling. Training of this kind is absolutely vital! Don’t try this on your own, without at least having an experienced driller with you to guide you through the process. Even experienced drillers run into problems they cannot immediately solve. Water well drilling is, in fact, a problem solving process. You will always come across situations that require knowledge and experience to overcome. Every borehole is different. Every location and situation is different. Experience is the best teacher, but you should have the training so you can first assist on a drilling team. After gaining the experience, you will eventually be equipped to tackle issues that may arise. So, read through these pages on the subject of bentonite clay. Consider this an informational introduction. If you want to pursue the subject further, contact the Great Organizations mentioned above and attend a class that teaches the science as well as the art of water well drilling. Pages containing information concerning bentonite are for informational purposes only, and are not intended to take the place of good, hands-on training from experienced well drillers. Return "Home" from "Bentonite Clay"